Location: Ventry in County Kerry, Ireland. Notes: Dunbeg Fort is a promontory fort built in the Iron Age near the modern village of Ventry in County Kerry, Ireland. 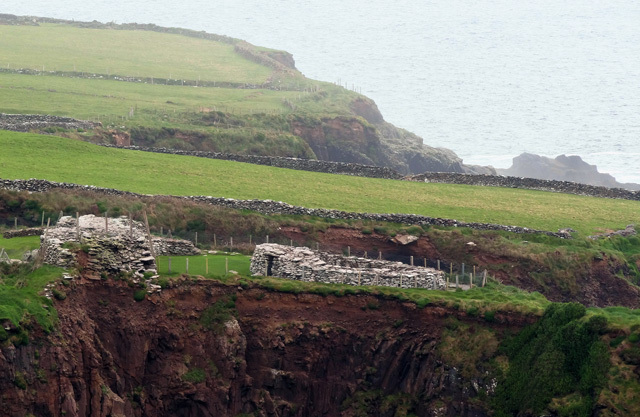 Dunbeg Fort is located on a rocky promontory just south of Slea Head on the Dingle Peninsula, looking over Dingle Bay to the south and the Atlantic Ocean to the west. The cliffs have eroded since it was built, and much of the fort has been lost to the sea. The fort's wall cut off access to the triangular promontory, which was later occupied by a single large "beehive" hut. Near to the fort there is a group of clochans, small stone structures also known as beehive huts that seem to have been built around 1000 BC. A visitor center at the site includes audiovisual displays, an information and craft room and a restaurant and cafe. In January 2014 the fort was closed when much of the western wall of the fort fell into the sea due to storm damage. The Office of Public Works and National Monuments Service sent personnel to investigate damage to the site.